I wasn’t always as slow as I am now. I used to be much slower! I wasn’t always a Penguin. I wasn’t always as slow as I am now. I used to be much slower! It took 40 years to become so overweight and out of shape that running a mile and running a marathon were equally unthinkable. For most of those 40 years, I looked at runners as if they were some mutant sub-species of the human race. I looked not with awe nor with envy as runners in my neighborhood trudged through rain, heat, cold and wind. I looked at them with suspicion. What motivated them? What was missing in their lives that they had to punish themselves on a regular basis? And then it happened. It wasn’t the epiphany that some folks describe. It was simply a matter of looking down at a body that was becoming my enemy and deciding that enough was enough. Those early days and weeks were a time of awakening. I bought a pair of running shoes, tied them on much too tightly and headed for the streets. Remembering the last time I had run, in high school gym class, I bolted down the driveway and into the future. That lasted about twenty steps. It was at that instant that I realized I had the legs of an old person. Those youthful appendages that had served me well in Little League and at the Prom were now unwilling to run longer than thirty seconds. So I walked. My guess is that my first humble attempt at running/walking/shuffling/panting lasted not even 600 yards and took nearly 5 minutes. I turned back, convinced that I had covered so much ground I would have a hard time finding my way home – only to discover that I’d barely made it down the block. But I had started. The next step toward Penguinhood was one of blissful naivete. I was amazed that my body was actually beginning to cooperate. That first “run” turned into a half-mile, a mile, then more. I was shocked at how quickly my body adapted to the new stresses. I was ready, or so I thought, for any challenge. Time to race! Standing at the start of my first race, a local 5-K, I barely noticed the other runners. Filled with the confidence that only abject ignorance can produce, I wondered how many of them had noticed me and if they were worried about my presence. After all, I knew how slow I had been and how much I had improved. At the start command, everybody bolted as if they had been blasted from a howitzer. I stood there like I was tied to a tree. Oh, I was running; I was running as hard as I had ever run. It was just that I was running very, very slowly. I watched in stunned amazement as men and women, young and old, short and tall, ran away from me as though I had some medieval plague. The 70-year old man I had been chatting with before the start dropped me like a bad habit. The woman behind me nearly knocked me over. It was my moment of enlightenment. I began laughing out loud at them and at myself. Off I ran, shaking my head. By the first mile marker, I was running nearly alone. I had run the fastest mile (a 10:30) of my life, and I could barely see the person ahead of me! But the smile on my face never faded. I knew then that running was going to be something I did mostly for the joy it brought me. Watching the other runners move away, I realized that I could not undo the physical effects of 40 years of indulgence in a matter of weeks or months. It had taken all my life to get to where I was; it was going to take the rest of my life to get to where I wanted to be. I went on to finish… and to keep a promise to myself. By finishing that first race, I began undoing four decades of unkept promises and doomed diets and quitting in general. Crossing the finish line, I knew that in my running, and in my life, the difference between success and failure would sometimes come down to a single step. HI John, I am a sloooow runner. I just started attempting to run in January at the age of 44. I ran a mile in just over 16 minutes, the last timed mile I did was 12:35 and I was over joyed. I still don’t like to run, but this coming year my resolution to myself is to learn to love it, I really want to love to run. I do like to get out there and power walk. In January when I started this journey my uncle sent me a hat that has been in the family for years and years and years, it has gone through several races and has never came in first but it always finished. It is one of the Penguin hats that says “Courage to Start” on the back. My uncle told me that he was proud of me and to keep on going… As long as I was moving forward I was doing great. 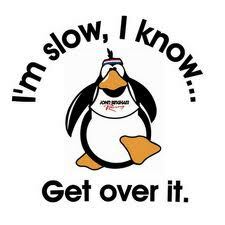 THANK YOU for starting this Penguin movement and supporting people like me to keep moving forward…. I will never be fast, but I will always finish.